Transportation and Public Infrastructure including roads, bridges, highways, terminals, subway systems, transportation hubs and airports. Governmental and Mixed Use including military installations, hospitals, parking facilities, stadiums and arenas, convention centers, retail complexes, office towers, hotel properties, mixed-use properties, water & sewer, streets, recreation & parks, and public infrastructure. Energy and Clean Technologies including utilities, biofuel and ethanol refineries, waste-to-energy facilities, commercial scale solar, wind and other renewable power installations, and water/waste treatment plants. 501(c)(3) Facilities including colleges, universities, schools, residential housing, nursing homes and assisted-living facilities. Industrial and Logistics including warehouses, equipment manufacturers, fulfillment manufacturing, distribution centers and industrial parks. Commercial and Multifamily Residential corporate headquarters, office buildings, multifamily, and mixed-use office, residential and/or retail. 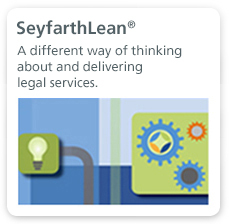 Seyfarth’s Project Development & Finance team guides clients through all aspects of a projects development, financing and operation. The team includes experienced lawyers in private and public finance, construction, real estate, energy, tax and environmental law. 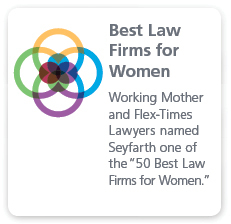 They are supported by lawyers from the firm’s leading litigation practice in the event that a dispute arises during a project’s construction or operation. The team has experience negotiating joint ventures and developing innovative financing structures, to responding to bids and structuring concessions. Seyfarth’s project finance team regularly represents agents, lenders, and borrowers in the full range of financings, from early stage to constructions to exit financing, secured by a diverse array assets, both in the U.S. and internationally. 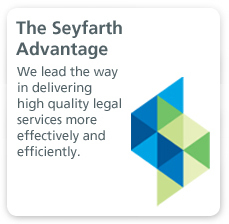 Clients engage Seyfarth because we work hard to proactively identify market, revenue and other risks and liabilities that could impact a projects success. Represented a major metropolitan city in connection with a 10-acre redevelopment mixed-use site. The transaction included government and regulatory approvals, project development agreements and ground leases and construction documents. Represented leading financial services organization in a joint venture. The joint venture acquired a parcel in Long Island City and will develop a 188-unit apartment building with ground floor retail space. As part of the transaction, we negotiated a development agreement, a management and leasing agreement, and simultaneously closed a construction loan. Represented a Development Authority as bond counsel in a $440 million complex transaction involving the issuance of three series of taxable revenue bonds. The project required innovative financing structures to accommodate the vertical mixed-use development offering live-work-play-shop opportunities in an urban environment. Represented a major city authority in connection with the construction of its $4 billion transit center. The work involved all facets of construction, from contract and RFP drafting and negotiation, bid protests, risk mitigation, claims and project close-out issues. Represented the developer in connection with the multi-tier financing of an ethanol plant expansion project, which included two equity financings completed in both the US and the UK, two debt financings and a subordinated debt tax exempt bond financing. In total, we raised in excess of $210 million for the client. Represented a developer in connection with its $1 billion air-rights project in a major metropolitan city that includes decking over a depressed portion of a highway, altering highway ingress and egress, building two bridges, and creating three new blocks of mixed-use buildings over the highway. We are preparing the design, professional service and construction contracts for the project, which has involved understanding and integrating Federal Highway Administration and local transportation department requirements. Represented one of the world’s leading construction companies in developing a $1.8 billion nitrogen fertilizer facility in the United States. Construction Practice wins Chambers USA Award for Excellence 2012.